Save the date! We are having our LGBTQ Best Practices Training in Calistoga on Thursday, April 19 from 1:00pm – 5:00pm at the Calistoga Jr/Sr High Schools library (1608 Lake Street, Calistoga, CA). Our trainers are bilingual and can answer questions in English or Spanish, but this training will be held in English. We are offering our very first LGBTQ training in Spanish "LGBTQ en Español" to better serve our Spanish-speaking young people and their families. This is one part of LGBTQ Connection's new Latino LGBTQI Youth inclusion project funded by Horizons Foundation and Community Foundation Sonoma County's LGBTQI Giving Circle. Presently, our North Bay communities in Napa and Sonoma have essentially ZERO LGBTQ resources specific to Spanish speakers. Let's change that; Our young people deserve better. 29 de marzo en Napa: Una plática familiar, "la Unión Hace la Fuerza"
Sabemos que nuestras comunidades en estos momentos necesitan apoyo. LGBTQ Connection no solamente existe para crear comunidad con personas LGBTQ (gay y transgénero) pero para crear conexiones entre las muchas partes de nuestras comunidades. Creemos que es importante crear juntos espacios donde nos podamos sentir apoyados y seguros. We know that our communities need support during these current times more than ever. LGBTQ Connection doesn't only exist to create community for LGBTQ people, but to create supportive connections among many parts of our communities. We believe that it is important to create spaces where we can feel supported and safe. Thursday, March 15, 2018 from 4-8pm, every draft beer purchased donates $1 in support of LGBTQ Connection's work with local youth and community. The “Golden Years” can be challenging. You may find yourself free from the daily grind of work and parenting, but you’re likely also dealing with increased financial pressure and health problems. But if you are a member of the LGBT community, these challenges, particularly isolation, can be magnified. There is a place where seniors from the lesbian, gay, bisexual and transgender communities in Napa can get together regularly for socializing and mutual support. The "LOVE IS LOVE YOUTH DANCE" will be on Saturday, February 24 starting at 7:00pm. The Gender Sexuality Awareness (GSA) Club of Sonoma Valley High School teamed up with LGBTQ Connection Sonoma to create an event that celebrates love in all its forms and to launch our LGBTQ youth program in Sonoma Valley! "Unidos: Celebrando el Amor, Amistad y Aceptación Familiar," es un evento destinado a reunir a nuestras familias/amigos, con el fin de aumentar el apoyo y el bienestar de personas gays y transgéneros que son nuestros amigos, familiares y vecinos. A group of high school students stepped up – and out – to be leaders in Calistoga and in their LGBTQ community with the launch of a new team and support group based at the high school. We Support Families with Gay & Trans Children! ¡Apoyamos a Families Con Hijos/as Gay y Trans! We are here to support families and organizations who want to grow love, trust and communication in support of LGBTQ children. Estamos aquí para apoyar a familias y organizaciones que desean crecer amor, confianza y comunicación para apoyar a hijos/as LGBTQ. “There definitely is this need,” said Eduardo Rivera, program coordinator at LGBTQ Connection. Especially in the Latino community, he said, LGBTQ issues are not things that are typically talked about. “Our goal is that, through our events and through our connections we make, that we get these parents involved so that when they become aware of how to better support their LGBTQ child,” as well as helping other parents, he said. Join us to watch El Canto del Colobri, a film exploring the heartfelt relationships between Latino immigrant fathers & their gay and transgender family members. El documental El Canto del Colibrí llega a Sonoma County! Acompáñanos a ver el canto del colibrí, un documental que explora las relaciones entre hombres inmigrantes Latinos y sus hijas (os) LGBTQ. Here come our cozy, warm, love-filled holiday celebrations! Anunciamos nuestras celebraciones comunitarias para Las Fiestas! Join us on December 14th for our annual LGBTQ family holiday party! Join us from 5pm – 8pm at our Napa center, 780 Lincoln Ave, Napa. This is a time for our full community to come together to celebrate each other, the season, and grow LGBTQ love. This is an all ages, bilingual event. Families are encouraged to come with their LGBTQ relatives! What a year it has been! We are proud to be part of this community and see how in times of need we continue to dig deep to support each other. We hope to see you on December 14th to celebrate our diversity, our stories and our love for each other. If you have any questions or would like to RSVP (not required, but helpful), please contact Eduardo at eduardo@lgbtqconnection.org or by calling 707-251-9432. ¡Únase a nosotros el 14 de diciembre para nuestra Posada Anual Familiar LGBTQ de 5pm a 8pm en nuestro centro de Napa, 780 Lincoln Ave! Este es un evento para que toda nuestra comunidad se reúna para celebrarnos el uno al otro, celebrar la temporada y crecer el amor LGBTQ. Este es un evento bilingüe para todas las personas y edades. ¡Se les anima a las familias a venir con sus parientes LGBTQ! ¡Que año ha sido! Estamos orgullosos de ser parte de esta comunidad y ver cómo en tiempos de necesidad continuamos apoyándonos mutuamente. Esperamos verte el 14 de diciembre para celebrar nuestra diversidad, nuestras historias y nuestro amor mutuo. Si tiene alguna pregunta o desea confirmar su asistencia (no es necesario, pero es apreciado), comunícate con Eduardo escribiendo a eduardo@lgbtqconnection.org o llamando al 707-251-9432. Our LGBTQ youth leaders, in collaboration with Positive Images, are hosting a warm, holiday gathering at the Fountaingrove Lodge, an LGBTQ retirement home. Fountaingrove Lodge residents were evacuated from the fires for several weeks, and were only able to return home recently. Join us as we welcome them back to their home, build connections across generations, and create a space for people to find healing after the fires. After the North Bay Fires, our youth felt a need to bring the whole community together and create a sense of unity. So, we brainstormed with Positive Images and decided to create a collaborative event for the whole LGBTQ community, especially those affected by the fire. We promise fun, community, and a place to call home. Who's Invited? The whole LGBTQ community and allies. All Ages. All welcome. Why? To bring together our community for a sense of comfort, home, and healing. If you have any questions don't hesitate to ask. RSVPs are appreciated but not required. Email Eliseo@lgbtqconnection.org or RSVP on Facebook: http://bit.ly/2hBAbFS. You may also call 707-583-9169 for more info. Free training opportunities: Best Practices to reach & include LGBTQ people! Mark your calendars! We have two upcoming, free LGBTQ Best Practices Trainings to help our community to improve their awareness of & inclusion of Lesbian, Gay, Bisexual, & Transgender people. These next trainings will be primarily in English, although staff are bilingual and can answer questions about content in English and Spanish. Estamos emocionados en anunciar nuestro próximo evento en español que será Cafecito y Charla. Acompáñenos para un hora de charla. El propósito de esta charla es para crear comunidad y crear un espacio para aprender como apoyar a nuestros jóvenes gay y transgénero. 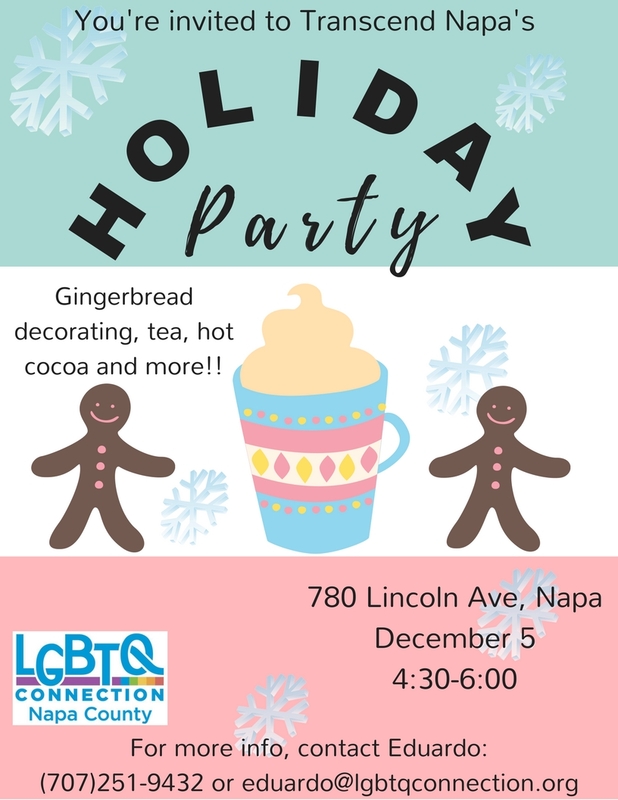 Calistoga, meet LGBTQ Connection! / ¡Calistoga, le presentamos a LGBTQ Connection! Regularly, we are in Calistoga on Wednesdays and Fridays from 1:30p to 6:30p. We are located at the Calistoga Junior Senior High School in a shared office with the UpValley Family Center. Usualmente, estamos en Calistoga los miércoles y viernes de 1:30p a 6:30p. Estamos ubicados en la prepa Calistoga Junior Senior High School en una oficina compartida con el centro familiar de UpValley.